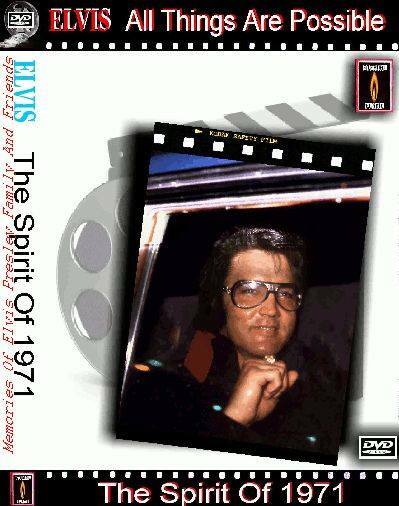 The Spirit Of 1971 DVD follows the DVD Elvis 1969-1970. After the much publicized Las Vegas shows in 1969 and 1970, Elvis returned to Vegas in 1971 for another run at the International Hotel. The shows Elvis gave during 1971 in Las Vegas, Tahoe and on the road are not widely known to many Elvis fans. Not many good photos were taken, not many press and news reviews were written. Thanks to a couple of soundboards and a handful of audible audience recordings a little bit more is know about Elvis in concert during that year. This DVD brings you yet another crucial piece of information: footage of Elvis on stage during that same year. Preference has been given to the historic importance of this footage and we are confident that it will give you a pleasant and crucial insight into Elvis on stage in 1971. The footage has been edited with actual 1971 recordings of Elvis to enhance your viewing pleasure. This DVD presents the sights of Las Vegas in the early Seventies and Elvis on stage wearing many spectacular and rare suits. The most famous being the 'Elvis Now' suit. This DVD gives you the most complete and true spirit of Elvis in 1971 ever: from the International Hotel to Elvis on the road with many clips in amazing quality! So see and hear Elvis in: Las Vegas / Boston / Dallas / Houston / Baltimore / Cincinnati / Kansas City.